It would appear that most GAA supporters stayed at home to watch the Munster Final then venture to Swinford Amenity Park for a game not rich in football but highly enjoyable all the same. 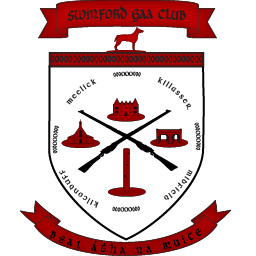 Swinford entered the game needing a win to avoid a relegation play off whislt a draw would do Kilfian. Kilfian started the game the stronger and were leading by 1-1 after ten minutes. The goal came from a line ball kicked in a round the box that was not dealt with and was fisted to the back of the net. Points from Jason McLoughlin and a free from Kevin McDonagh kept us in touch but they were soon canceled out by two points for Kilfian to maintain a four point lead. Two frees from the reliable boot of Kevin McDonagh kept is in touch before Kilfian got another point before the break. We started off the second half very strongly and we were soon level with a fine goal from Jason McLoughlin. Kevin McDonagh soon added a point from the deadball. A great save from Sean Kavanagh kept our slender lead which was soon extended by a great point from Kevin McDonagh which involved a sweeping move up the field. Kilfian got their first score of the second half to bring it back to a one point game before Jason McLoughlin got his second point of the game. After 15 minutes we were leading 1-7 to 1-5 and in control of the game. Unfortunately we failed to score for the remainder of the game and Kilfian scored five points to win by 1-10 to 1-7. Matters could have been worse but for another five save by Sean Kavanagh. We now go to a relegation play off in the coming weeks. The move up to Junior A was very hard this year as we were drawn in a tough group and the loss of a number of players did not help. Swinford: Sean Kavanagh, John Gerard Kelly, Sean Brady, Alan McLoughlin, Aiden McLoughlin, Cillian O’Donnell, Pearse Walsh, James Lavin, Kevin McDonagh, Mark McNicholas, Jason McLoughlin, Paddy Ward, Johnnie Pidgeon, Andy Lenehan, Shane Julian. Subs: Pearse Rowley, Aaron Kinsella, Eamon Dunleavy.